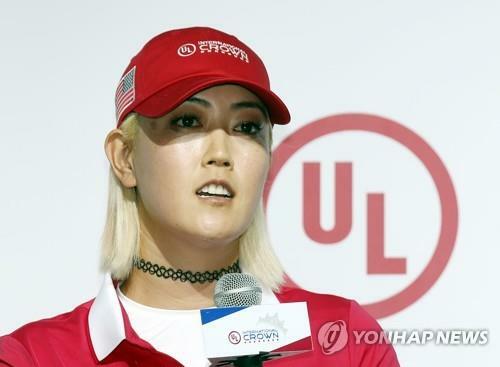 INCHEON, Oct. 2 (Yonhap) — Before the 2018 LPGA season began, Michelle Wie made it her goal to make the U.S. team for the UL International Crown, a fledgling match play competition set to be staged in South Korea this week. Born in Hawaii to South Korean parents, Wie knew how much fun she’d have competing before her family members at Jack Nicklaus Golf Club Korea in Incheon, just west of Seoul. Indeed, “fun” was Wie’s favorite word during her press conference at the tournament venue, as she switched between English and Korean to discuss the event that begins Thursday. The U.S. is the defending champion of the eight-nation competition. Each country is represented by four players, selected based on their world ranking positions in early July. Wie comes in ranked 21st, lowest on her team, behind Lexi Thompson (No. 5), Jessica Korda (No. 11) and Cristie Kerr (No. 19). Wie reached No. 13 in April, but a wrist injury that kept her sidelined for the past two months led her to fall in the rankings.